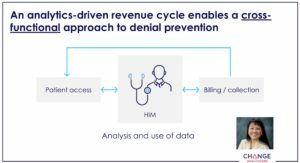 We operate in an already complicated reimbursements environment, so anything we can do to minimize the constant threat of denials is going to help the entire revenue cycle. Prior authorization and medical necessity. Ongoing analysis across the revenue cycle. You’ll want to visit the article link, as they provide excellent analysis of each factor. Needless to say, OrboAccess tools that provide full research access to transactional data are in lock-step with their recommendations!